While heartworm is not widely prevalent among cats in the U.S., it is still a parasite cat owners should be aware of. Especially if you live in an area known for heavy heartworm infestation, prevention prior to your cat becoming infected is critical. According to the American Heartworm Society, heartworm, also known as Dirofilariasis immitis, are worms that infest a cat's heart, lungs and the blood vessels surrounding these organs. Dogs are affected far more than cats. Some researchers claim the rate is between five and 20% of that of dogs whereas others say it's about one-tenth of the rate. Cats infested with heartworms tend to have around six or less worms compared to dogs who tend to have many more. The heartworms in cats are much smaller and do not live as long. How are Cats Infected with Heartworm? Heartworm is transmitted through mosquito bites. The mosquitos serve as hosts for the worm larvae and these are injected into the bloodstream while the mosquito bites and takes in blood from the cat. The mosquitos most likely have been infested through similar contact with dogs who have heartworm disease themselves. Another unfortunate symptom of heartworm is the cat dying unexpectedly. When a cat is infected with heartworm, it can take about six months before they become adults. From there it takes an additional two months to three months for the worms to develop and produce microfilaria which are a new set of worms. As this cycle repeats itself, cats can continue undiagnosed over the course of several years. Since there is no cure for heartworm and it is often diagnosed long after the infection is spread, heartworm in cats can ultimately be fatal. An antigen test is designed to detect a heartworm infestation. Antigen tests are not perfect and the subject of some debate over how effective they are. Dr. Megan Teiber, Veterinary Consultant for Tuft and Paw, states, "An antigen test will only pick up the presence of mature female heartworms. In cases with only a few adult worms, male worms, or immature worms, an antigen test may yield a false negative result." She further notes, "If a cat has a positive antigen test, you can be fairly certain that infection is present. However, a negative test does not rule out heartworm disease." Dr. Teiber describes a more effective method of diagnosing heartworm: "When testing cats for heartworm, the antigen test is commonly done in combination with an antibody test. This reveals whether a cat has been exposed to heartworm and mounted an immune response to the parasite. 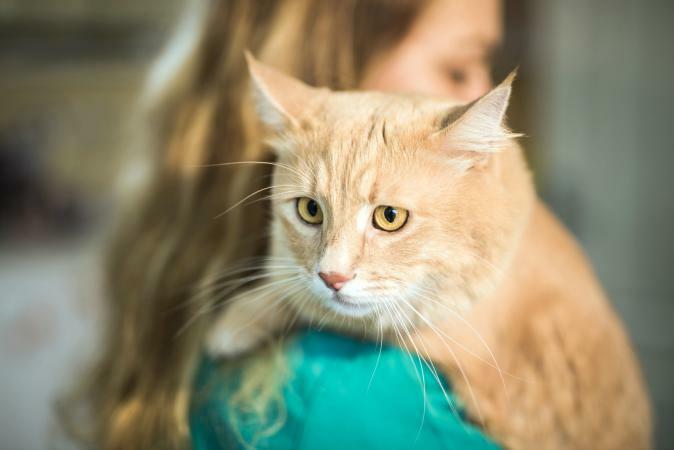 Clinicians often evaluate the results of both tests in combination with a physical exam and x-ray findings to diagnose heartworm infection in cats." Currently there are no established treatments for heartworm in cats, other than treating the symptoms to make the cat more comfortable. Says Dr. Teiber, "Cats suffer severe and often fatal inflammatory reactions in response to rapid heartworm death. Therefore, the medications available to kill heartworms in dogs must not be used in cats." She continues, "Cats may be treated with monthly heartworm preventative medication (Ivermectin) to slowly kill worms and reduce overall worm burden. Even with this treatment, adverse inflammatory airway responses are possible. Therefore, cats remain infected with heartworm for life. Supportive treatments such as steroid and airway dilator medications are often used alleviate the symptoms of heartworm disease." The American Heartworm Society advises owners to hold off on treatment for your cat if no symptoms are present. After two to three years, the heartworms should die out and no longer affect your cat. Presently surgery is not provided in the United States to remove heartworms from cats. However, there are surgical procedures in Japan and Europe. These are still in an early stage of testing and could be an effective treatment. It has been tested successfully in 2017 at the UC Davis Veterinary Hospital. Even if your cat is an indoor-only cat, if you live where heartworm is a known problem, they should receive heartworm prevention medication. These medications need to be taken monthly and delaying them can greatly reduce their effectiveness. Your cat should be on these medications for their entire lifespan. If you move to an area where heartworm is not an issue, consult with your new veterinarian about continuing the medication. Advantage Monthly (Imidacloprid, Moxidectin) is given once a month in a topical solution applied along the back of a cat. It's available by prescription only and runs from $54 to $170, depending the size of your cat and the 6-pack or 12-pack supply. Revolution (Selamectin) is applied similar as Advantage monthly. A vet must approve a prescription for Revolution. The drug costs between $40 and $180. The price depends on your cat's weight and whether you purchase a 3, 6 or 12-pack. Ivermectin (Stromectol) is a chewable tablet and can be purchased over-the-counter. It is advised to discuss with your veterinarian first as too high a dosage can be toxic. It is sold under several names including Ivomec, Iverhard, Interceptor and Heartguard. It sells for about $28 to $35 depending on the brand. Both medications are also effective in treatment for fleas, ear mites, roundworms and hookworms. Where are Heartworms a Known Problem? Heartworm is present all over the United States although it may be less intense in some areas. Consult with your veterinarian on using heartworm prevention medication if you are not sure if your area is cause for concern. Heartworm tends to be worst in areas with larger mosquito populations, such as warmer, more humid climates. Do Indoor Cats Get Heartworm? Heartworm is far more prevalent in indoor/outdoor cats compared to cats that live indoors. About 60% of infected cats are indoor/outdoor cats. Currently there are no vaccines available to prevent heartworm in cats. The only options for prevention are monthly preventive medications and keeping your cats indoors. While it's wise to be concerned about a diagnosis of heartworm for your cat, it is good to be aware of the decreased likelihood of serious complications compared to dogs with heartworm. Consult with your veterinarian for the various treatment options. Do not neglect to use heartworm preventative medication as well to protect your cat!